Pro-Motive Concepts: Your #1 source for performance parts! Welcome to Pro-Motive Concepts LLC. We specialize in Auto and Truck parts and accessories. We have a wide selection of air intakes, exhaust, body parts, suspension kits, clutches, ECU upgrades, turbo kits and more in stock for your vehicle! This is the same durable, race proven intercooler core we used on our record setting Time Attack EVO, proven efficient to 650 whp. This intercooler has over 80% more internal flow area than its stock counterpart, works with stock and some aftermarket piping and even allows you to retain the front bumper beam! Let the competition know that your EVO means business with a genuine AMS Intercooler but be warned the intimidating AMS logo may scare them off! Engineered Quality For Superior Performance & Durability. This AMS Intercooler now features cast aluminum end tanks for added durability with smoother features and geometry. Designed by our engineering team using Solidworks (3D CAD software) these A356 T6 Alloy Aluminum end tanks have improved flow over sheet metal end tanks and include gusseted brackets to prevent cracking or failure. We go beyond our competition to ensure quality. Each AMS Intercooler is hand TIG welded in a jig for a perfect fit and pressure tested to 50 psi to ensure maximum performance. We tested many intercooler cores to find the best performing core available. The super efficient 3.5 thick AMS Intercooler even out flows the competitions 4 core and provides better fitment. With a cross section flow area of 45 inches square this is the largest intercooler on the market that fits without cutting the bumper beam. There are other "more affordable" intercoolers on the market that start out at a 3" thick core that you can upgrade to 3.5" or thicker but the 3.5 standard AMS Intercooler still out performs the competition without any cutting of your bumper! Slight trimming of plastic under tray required. 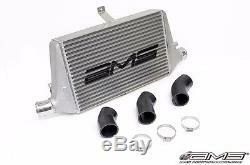 Do it right the first time, order your AMS EVO Front Mount Intercooler today! 80% more internal flow area than stock. Flows more CFM than the competitions even larger Race cores. 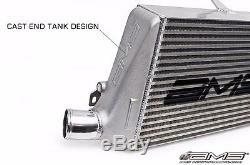 Best performing intercooler on the market and doesnt require removal of front bumper beam! Highest quality, most durable mounting on the market utilizing all 3 factory mounts. Will bolt up to your stock piping or any aftermarket pipe kit that is designed for the stock intercooler. Bar and plate style core, the best performing on the market. All AMS intercoolers are pressure tested after assembly to 50 psi. Silicone couplers to fit a wide variety of intercooler piping. 12.4" tall, 20" wide (28" with end tanks) and 3.5" thick. 1250 cfm flow and only 1 psi pressure drop at 650 whp. Comes With the Black "AMS" Painted Logo. GSR, MR, RS and SE. Fits all USDM, JDM and European Models Modification to plastic undertray may be necessary. EVO IX Owners Please Note: If you have an EVO IX please make note of the added installation step in the instructions. Check out our store for more Mitsubishi performance parts! The item "AMS 2003-2006 MITSUBISHI EVO EVOLUTION VIII IX 8 9 FMIC FRONT MOUNT INTERCOOLER" is in sale since Friday, July 1, 2016. This item is in the category "eBay Motors\Parts & Accessories\Car & Truck Parts\Turbos, Nitrous, Superchargers\Turbo Chargers & Parts". The seller is "promotiveconceptsllc" and is located in Multiple Warehouses. This item can be shipped to United States, Canada, United Kingdom, Denmark, Romania, Slovakia, Bulgaria, Czech republic, Finland, Hungary, Latvia, Lithuania, Malta, Estonia, Australia, Greece, Portugal, Cyprus, Slovenia, Japan, Sweden, South Korea, Taiwan, South africa, Thailand, Belgium, France, Hong Kong, Ireland, Netherlands, Poland, Spain, Italy, Germany, Austria, Bahamas, Israel, Mexico, New Zealand, Singapore, Switzerland, Norway, Saudi arabia, United arab emirates, Qatar, Kuwait, Bahrain, Croatia, Malaysia, Brazil, Chile, Colombia, Costa rica, Panama, Viet nam.